Recently during maintenance downtime early one Sunday morning, our VMware administrator was v-motioning numerous VM’s to patch the host environment blades on the Cisco UCS. One of the VM’s was a Windows 2008 R2 server that contained over 10 iSCSI connections to targets residing on an EMC Celerra NS-40G NAS. All migrations were going well until this particular VM was moved: all of the iSCSI drives disappeared from the Windows OS. A vMotion process is a transparent process and this should not have happened, but this time it had a negative effect on the VM: an unexpected glitch. This happens time to time. The iSCSI initiator in the Windows Server OS still registered the connections as connected and online, but the OS disk management would not see the drives. I disconnected and then re-connected the targets in the iSCSI client, but the Windows OS would still not see the drives. I restarted both the iSCSI initiator and Server service in the Windows OS with the same result. Re-scanning for storage in Windows disk management did not help. EMC tech support ran a check on the NAS end and came up with nothing. 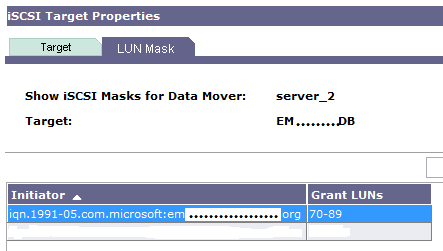 Eventually, I went into Celerra Manager and deleted the LUN masking for the target and then re-added it. The Windows Server OS was then able to see the drives. I was hesitant to do his at first, as I was unsure what effect it would have on the drive letter assignments on the server: it had no effect on that – all drives were reestablished as the previously were.